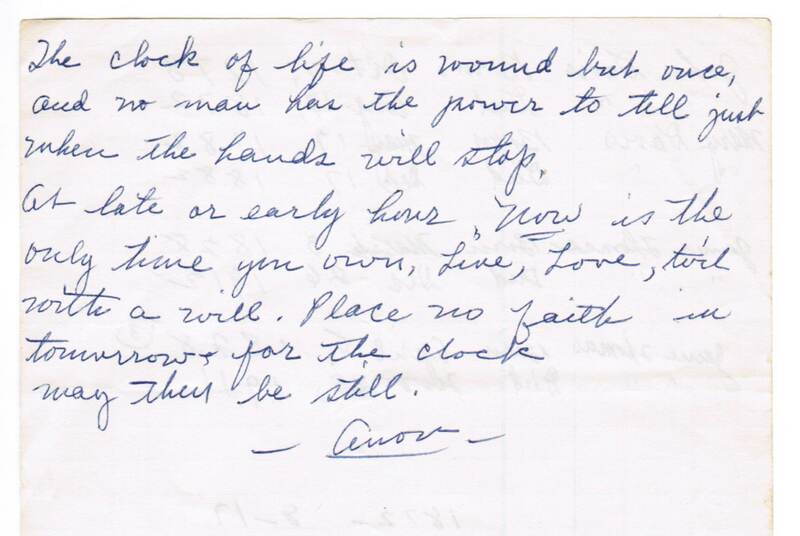 Two poems have significance in my family history – “The Arrow and the Song” by Henry Wadsworth Longfellow and “The Clock of Life” by Robert H. Smith. 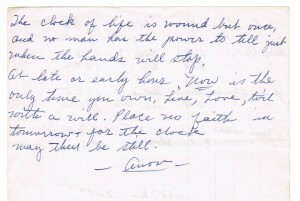 After my grandma passed we found “The Clock of Life” written again and again on index cards, notebook paper, paper scraps, and stationery. I know there is more to this poem than what she recorded, but this is the part that was meaningful to her. 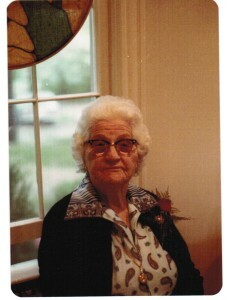 My grandma lived through both World Wars and the Depression. She was the wife of a tenant farmer, and they moved often. Between 1923 and 1943, they lived in 12 different places. Two of her brothers died as boys, one after a freak accident. She was a widow for 24 years, and she buried 4 of her 8 children before she passed at the age of 84. My grandma, Florrie Thomas Martin, in 1978. She knew how ugly life could be, but she didn’t let that fact control how she lived her life. She was generous with her time and her prayers, and with the small amount of social security she received and what she made selling her crocheted creations. She laughed sometimes until she cried, and she loved people as they were, not how she wished they would be. She lived each day for the gift that it was, an admirable example of how to live. What words to live by did your ancestors leave for you?